the most out of their motorcycles, be it parts or pre-race maintenance, we can help you out! Whether it is a full-on Motocross bike with 12” suspension travel or a trail bike with only 8” of movement, having it set up for you will make a huge improvement in both your confidence and safety. We find that when a bike crushes down in the back due to an improperly set up rear shock, the rider will struggle with a front tire that washes out in corners on a track and is unwilling to stay in a rut or single track when on throttle in the woods. A properly set up bike will distribute the rider’s weight evenly, balancing both grip and confidence nicely. Having the clickers set properly will help massively with traction in both ends as well as holding the chassis where it should be as it cycles over the bumps. If you need Fork Springs or Shock Springs to hit your target sag, we will let you know and often have it in stock. Your bike will handle safer and absorb bumps better, staying in control is easier when your bike is set up properly for you. We train you on what we are doing and why and then guide you on how to make your own adjustments after you leave our shop. Off Road motorcycle sag and set up starts at $110 and is done by booking an appointment and bringing your bike in to our shop. 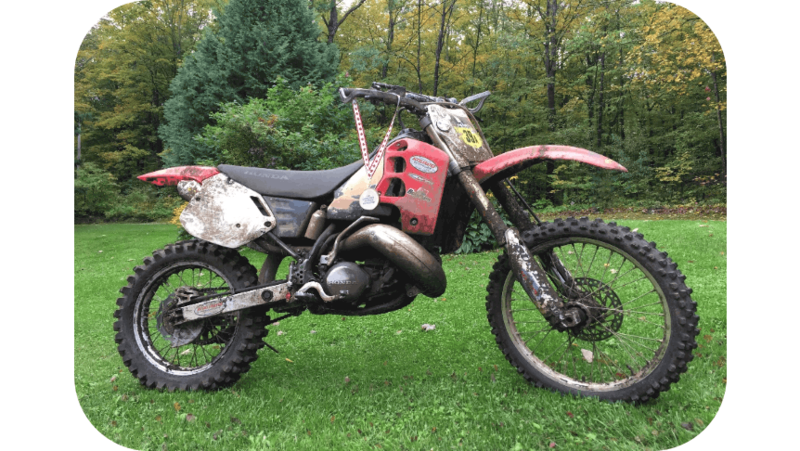 Off road motorcycle forks constantly battle dirt ingression as well as generating it internally from metal tubes sliding on bushings that are side loaded constantly and worse while jumping and braking. Pouring out your fork oil by yourself overnight gets about ¼ of the contamination out of the bottom of the fork and none out of the cartridge where the particulate has wedged into the shim stack holding it open slightly, dramatically reducing the damping. Whether you have open chamber conventional forks or closed chamber pressurized forks, we disassemble the cartridge, pistons, all shims, the then the tubes themselves to examine and service the bushings, seals and wipers where brake dust, bug guts, dirt and dust gets embedded. We often change the wear parts and then lathe polish the fork tubes to remove traces of vertical scoring. This helps the seals run smooth and do their job and can dramatically reduce friction. Base price starts at $260 plus parts, (seals, bushings, wipers, Orings, new copper base bolt washers) and lathe polishing if required. Revalve service and Respringing is available if improvements are desired. Off Road shocks generate an incredible amount of heat internally. The piston wear band is flying up and down in its bore generating lots of contamination, especially in a new bike during break in. We recognize that we need to change the oil in our engine every few motos, but we somehow think the 0.4 litres trapped in our shock since our bike was new will last forever! Most riders don’t feel the slow 1% shock oil degradation every time we ride the bike. The oil slowly fails as engine heat and constant bump motion break it down thermally and dilute it with suspended contamination. Sediment drops down and accumulates around the shaft and the seal head inside the shock, making it sticky and reducing ride comfort. Most will only service the shock when it finally gives up, fails completely, and dumps its oil out. You don’t wait till a connecting rod comes out of your engine cases before changing your engine oil do you? Expect a dramatic improvement in comfort, bump compliance, and performance with just a shock service, which gives us the chance to remove all the break in contamination, clean the shim stack, and rebuild it with fresh nitrogen, synthetic oil, and grease. Base price starts at $165 for most Showa, KYB, WP and Marzocchi(sp) shocks plus any seals, orings, nitrogen seals, lathe polishing and other repairs that may be needed after inspection. Revalve service and Respringing is available if improvements are desired. Many woods riders will prefer a full-on Motocross bike to rip up their favourite single track. They open the clickers all the way on the forks and the shock and the ride is still way too harsh. We can insert the enduro valve stacks right from the factory or come up with our own recipe based on your input for your individual situation. Perhaps you ride faster with more aggressive inputs than the stock settings can handle? If you have adjusted your compression or rebound all the way to one extreme and it keeps getting better, then you find the adjuster at max or minimum? You are then a candidate for getting your suspension revalved. We will ask you pointed questions about your riding style and expectations and then ask you if you have exhausted the stock adjustments on your bike. What did you find as you made adjustments? Have you changed the springs on your bike to correct for your weight? If so, you may need a revalve to control the new springs properly. Are your clickers all the way open or shut? The revalve fee for a shock or pair of forks starts at $65 plus shims and will be added to your fork or shock service if you need it. Shims range from $2.50 to $3.00 each. We may need two or three in a shock that is close, or 20-30 in a pair of forks if they are sadly out to lunch. We can guide you completely on your revalve needs and let you know if you would benefit. Lets be honest. Do you or your kid own a pressure washer? If so, you need to think about a Chassis Service. A 3000 psi pressure washer will win all day long when faced with a soft linkage bearing or swing arm bearing seal. Your chain? It doesn’t stand a chance. Every season, and more if you are serious, should see you cleaning and greasing your linkage, swing arm pivot, wheel bearings and steering head bearings to remove all water and contamination. If the bike sits after washing through a winter, the bearings will likely have to be replaced, not just greased as pitting from rust will affect wheel traction and ride compliance. Chain rollers, wheel bearings, lever and shifter pivots, cables, the throttle tube mechanism etc, all need constant love and lubrication. If you aren’t up for it, give us a call and book an appointment. Making sure all these critical pivots are smooth and lubricated is what makes a brand new bike feel… well, like brand new. When we elevate your bike to remove the forks for Fork Service, this is the perfect time to gently swing the handlebars from left to right to check for sticky or notchy steering head bearings. We then try and gently pull and push on the axle to see if the bearings are just loose, as they naturally become over time. Any excessive play in the fork bushings can be confirmed at this time. After we have elevated the bike and removed the shock for Shock Service we can pivot the swingarm through it’s range of motion to see if the linkage bearings or swing arm pivot need grease or replacing. None of these bearings are very expensive (usually $20-40 each) and with the suspension out, half of the labour has already been done. Bad bearings are often hard to feel but make the bike hunt in a straight line and ride poorly, reducing rider confidence without knowing why, reduce bump compliance for sure and if left longer, full seizing can result with dramatic effects on safety. Thinking of a Rekluse clutch install to make stalling a thing of the past? How about a Tubliss tire conversion for the ultimate in low pressure traction? Give us a call. Want to discuss a gearing change with a lighter chain for improved acceleration and reduced drag? We can tackle it. Thinking you are finally quick enough that a Scott’s Steering stabilizer will help keep you safely between the trees better? We are a dealer. Want a tire recommendation for the Corduroy Enduro? Come on in. We will discuss your wishes and expectations with you, decide on a budget, and then recommend how best to meet your goals in a timely fashion. From engine modifications, exhaust changes and fuel injection improvements to tires, gearing changes, weight reduction and dyno tuning, we can facilitate most dreams you have for your bike to make huge improvements. An extensive range of suppliers ship parts to us constantly to help us maintain and improve hundreds of bikes a year. Have you ever picked your bike up after a fall only to see the handlebars slightly (or badly) out of alignment from the front wheel? No permanent damage has been done, but you are now riding a bike with the triple clamps twisted out of alignment. The steering stops used to protect your bike are attached to the lower triple clamp and the handlebars are attached to the top triple clamp. In a simple fall at speed the bars hit the ground with the bike still driving forward. The triples quickly smack the steering stops and keep going slightly, twisting the wheel in relationship to the top triple clamp. A kick to the tire or smack in the opposite direction will get it back close, but it is not perfect. We spend tremendous time checking the smallest variances in fork alignment, so the bushings run true, which puts friction as close to zero as we can get. Here is an experiment for you… balance your bike beside you and push down once, then twice on your handlebar pad. The front suspension should move freely and easily. I bet your back fender went up and down after the first settle push and the front forks are locked solid… they are not operating near where they should be. When forks are sticky they run high in the travel, don’t compress properly and give terrible grip, confidence and feedback. This is all from a light fall. We are experts at diagnosing crash repair of all magnitudes. Just bolting on new parts is often not enough. We wish none of our customers ever fell down, but bikes have only two wheels and both physics and gravity are proven forces. We measure the wheels and brake rotors for lateral and radial run out (bending), we examine the steering stops for impact level, we measure the inner and outer fork tubes for straight, we then feel and examine steering head bearings and handlebars until we find where the energy of the impact has stopped. We can straighten most fork tubes if not creased from a bad impact, and true some bent wheels as well. We have perfected bent rotors in house and trued spoked rims after even the slightest deflection damage from a (suspected) overzealous tire change. Our goal is rolling the bike out of our facility better than before your crash! Accidents happen, we can make it better!